KETCHIKAN, ALASKA - The "Discovery" Band is back! After nearly two years out of action, this high energy young band is back in full force and will be participating once again in the Sam Pitcher Concert. They join the Kayhi Jazz Ensemble, the Windjammers and Soundwaves in this annual concert full of jazz, rock, blues, Latin tunes and ballads. following a Kayhi Wind Ensemble concert in April 2003. The Sam Pitcher Concert is held each Fall, and its goal through donations, is to provide scholarships to help young people be able to attend summer music and arts camps and workshops. The first concert took place in the Fall of 2003. Recipients of grants provided by proceeds since then have assisted Amber and Courtney Kiffer, Jamie and Jeffery Karlson, Kim Stone, Lindy Parsons, Austin Hays, Matthew Perry and Jolene Pflaum in having these valuable experiences. Many of these young people have gone on to study music at the university level. 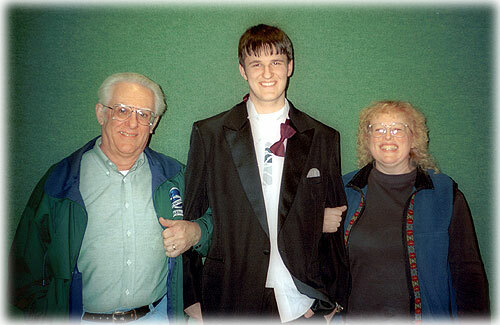 Sam Pitcher was a gifted and very popular young man who was active in all of the groups involved in this concert. He loved all types of music and the bands continue to perform a wide range of music in these concerts, in tribute to his memory. The Kayhi band will open the concert with "Count Bubba's Revenge", followed by Thelonius Monk's famous ballad, " 'Round Midnight", featuring Pat Doherty on alto saxophone. They will follow with a tune from the animated film "Happy Feet". The Discovery band will open with "I Heard It Through The Grapevine". Young soloists will be featured on a blues piece entitled "Two Bits", and Jaren Escueta will lead the band through "Galena Sunset" on piano. The set will close with "Louie, Louie". The Soundwaves Jazz Club will perform "Flight of the Foo Birds", written for the Count Basie Band, followed by Chuck Mangione's "Bellavia". "Crescent City Stomp" is an exciting New Orleans "backline" street beat tune featuring Niles Corporon on alto sax and Kim Stone on trumpet. The Soundwaves will close with Booker T's "Green Onions". The Windjammers will close out the program with "Spencer is Here", "First Child", recorded by the Stan Kenton Band, a piece entitled "Decoupage", which features the trombone section in 5/4 time, and they will close the program with Earth, Wind & Fire's "In The Stone". This years' program is scheduled for Thursday evening, December 13th at 7:00 p.m. at Kayhi. Donations will be accepted at the door.